Apple (AAPL) has lost over 30% of its value since last October due to concerns about the growth rate of iPhone sales. In turn, many of the company’s over 200 suppliers have seen their stocks crash in unison. Due to its immense size and the outsized media attention it receives, Apple tends to create a lot of noise that drags down all suppliers, regardless of the fundamentals of each business. This major iPhone supplier, which currently earns 30% of its revenue from Apple, has many positive drivers that the market currently undervalues in the face of Apple doom and gloom. 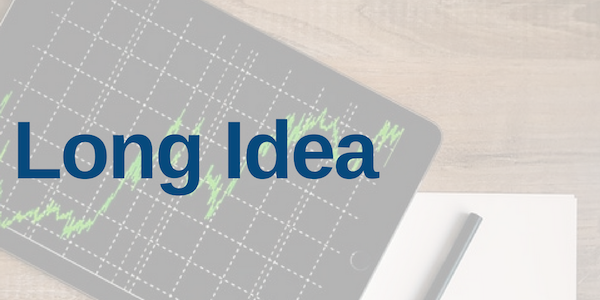 It has other high-growing business lines, new potential customers and uses for the products it sells to Apple, and it just completed the acquisition of one our top Long Ideas from last year that will further diversify its revenue away from Cupertino. 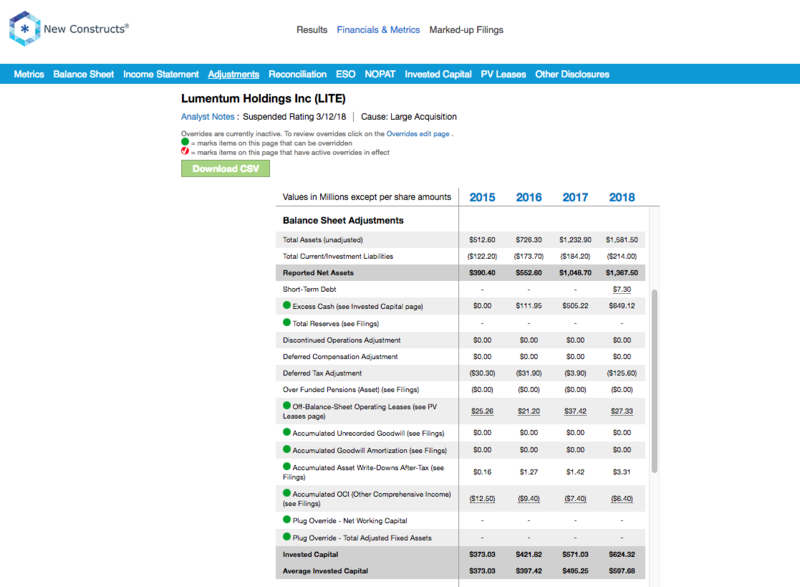 Lumentum Holdings (LITE: $45/share) is this week’s Long Idea. Photonics manufacturer Lumentum, which was spun out of JDS Uniphase in 2015, is best known as one of the suppliers of vertical-cavity surface-emitting lasers (VCSELs) that powers the 3D sensing FaceID feature in newer model iPhones. Over the past year, VCSEL’s have become a major component of Lumentum’s business, and Apple accounted for 30% of its revenue in 2018. However, framing Lumentum as solely an Apple supplier paints a misleading picture of the company’s underlying economics. In part, this characterization is due to misleading GAAP earnings, which show the company losing money every year until 2018. Figure 1 shows that economic earnings, the true cash flows of the business, actually turned positive in 2017, before Apple became a major component of the company’s revenue. 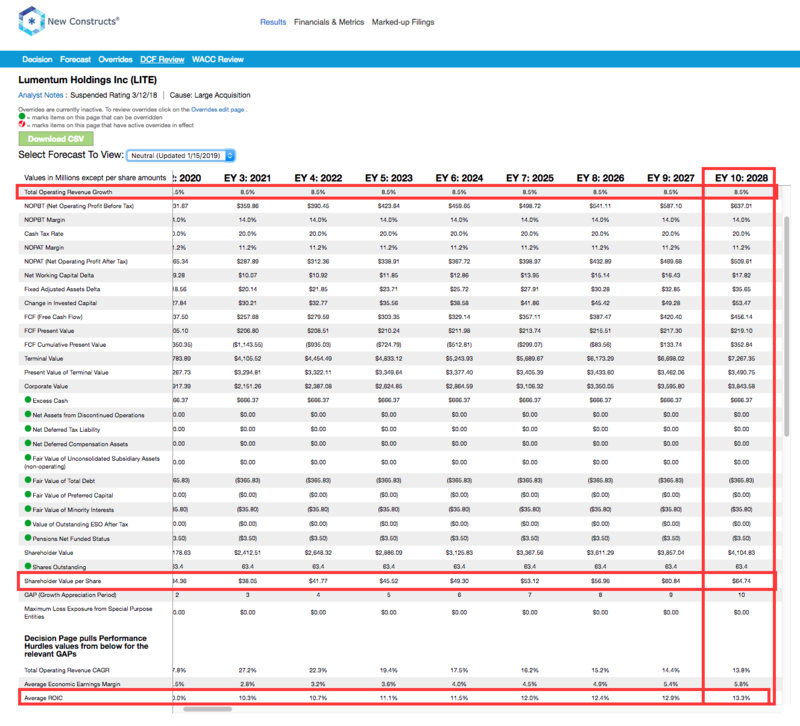 GAAP earnings significantly understated the company’s true profitability in 2017 due to two major non-recurring expenses: (1) $104 million (10% of revenue) charge for the increase in derivative liabilities on its preferred stock and (2) the $27 million (3% of revenue) charge for the increase deferred tax assets . As a result, LITE reported a GAAP loss of $103 million in 2017 even though it earned positive economic earnings of $14 million. In 2018, GAAP earnings rose sharply not because of doing business with Apple but due to an $80 million (6% of revenue) gain from tax reform. Combined, these accounting distortions suggested that Lumentum was a chronically unprofitable company transformed solely by its position as an Apple supplier. In reality, Lumentum is a diversified company with several other product lines outside of VCSELs that are growing rapidly. Most notably, the company’s Reconfigurable Optical Add-Drop Multiplexers (ROADMs) – which help route traffic through fiber-optic networks – are growing at double digit rates and earn gross margins above 40%. Investors worry that the recent stagnation in iPhone sales will lead to slower VCSEL sales and lower margins for Lumentum as Apple begins squeezing suppliers to maintain profits. However, there are many other potential uses for VCSELs that could drive growth going forward, as well as other segments of the business that can deliver growth. Lumentum has significant opportunities to grow its VCSEL business outside of Apple. For starters, the company can gain traction with other smartphone manufacturers that want to emulate the iPhone’s features. VCSEL revenue from Android customers grew by over 100% sequentially in the most recent quarter, and while it remains a minor component of revenue now, Android phones could become a major growth driver in the near future. More importantly, phone manufacturers are increasingly contemplating new uses for 3D sensing. So far, the feature has been confined to the front-facing camera and used for facial recognition. However, it could very soon be applied to the “world-facing” camera on phones and used for augmented reality applications. VCSELs could also provide 3D sensing for a variety of other consumer appliances. Longer-term, VCSELs have potential applications in self-driving cars, military systems, and industrial manufacturing. The VCSEL market is forecasted to grow at ~17% compounded annually over the next five years. As one of the leaders in the industry, Lumentum should benefit from this growth even if it faces headwinds over the next year from Apple. Lumentum should become even less reliant on Apple for revenue in 2019 due to the recently completed acquisition of Oclaro. We like this acquisition (which is rare) from a pure fundamentals perspective: Oclaro was one of our top picks in 2018, and the $8.26/share that Lumentum paid in the deal represents a 25% discount to the $11/share fair value that we estimated in our original article. In addition, this acquisition diversifies Lumentum further away from Apple. Oclaro’s leading position in 100 gigabit per second optical transceivers will – in addition to providing vertical integration opportunities with Lumentum’s portfolio of fiber optic products – provide an extra cushion in case the VCSEL market stagnates. Oclaro earned TTM revenue of $519 million, 38% of Lumentum’s revenue, so it brings in significant new revenue streams. Figure 2 shows the extent to which the acquisition of Oclaro will diversify Lumentum’s revenue streams. Apple shrinks from 30% of revenue to 22%, while revenue coming from outside of the top 4 customers increases from 39% to 45%. The Oclaro acquisition will lead to a decline in return on invested capital (ROIC) in the short-term, but it should increase economic earnings and lead to a more stable business over the long-term. Lumentum’s acquisition of Ocalro is part of a much larger trend of M&A activity in the photonics industry. Competitors II-VI (IIVI) and Finisar (FNSR) agreed to a $3.2 billion merger in November, fiber optic suppliers Infinera (INFN) and Coriant merged in October, and laser manufacturing company MKS Instruments (MKSI) announced a $1 billion acquisition of Electro Scientific Industries (ESIO) the same month. This consolidation should lead to greater bargaining power across the board for photonics suppliers as major customers like Apple have fewer potential suppliers from which to choose. Lumentum, as one of the largest and most profitable companies in the industry, should be one of the top beneficiaries of higher overall industry profitability. Figure 3 shows that the company recently surpassed the average of ROIC of the competitors listed in its 10-K. This industry growth and consolidation, combined with Lumentum’s status as one of the leading pure-play photonics companies, could make it a buyout target for a larger tech company. Broadcom (AVGO) stands out as a company with a history of large acquisitions that may want to increase its market share in the VCSEL space. Outside of Apple, the bear case against Lumentum revolves around continuing trade conflicts with China. As Figure 2 showed, Chinese company Huawei is a major customer of both Lumentum and Oclaro, and it currently accounts for 11% of the sales of the combined company. Huawei has been in the news lately after its CFO was arrested in Canada at the request of the U.S. on charges of violating sanctions against Iran. With little progress currently being made in negotiations between the U.S. and China, sales to Huawei and other Chinese companies could be at risk going forward. However, Lumentum’s sales to China have decreased as a percentage of revenue from 24% in 2016 to 15% in 2018. Lumentum also reduced its manufacturing presence in China last year, thereby mitigating the impact of potential tariffs. The company moved one of its manufacturing facilities from China to Thailand in 2018, which reduced the percentage of its property, plant, and equipment in China from 30% to 23%. The ongoing trade war remains a concern, but investors may be overestimating Lumentum’s exposure to China given the recent changes to its business. Per Figure 4, ROIC explains 92% of the difference in valuation for the 15 companies listed as peers in Lumentum’s proxy statement. These peers include direct competitors as well as companies involved in other sectors of the photonic and fiber optic industries. If LITE were to trade at parity with its peers, it would be worth $68/share today, a 50% upside to the current stock price. 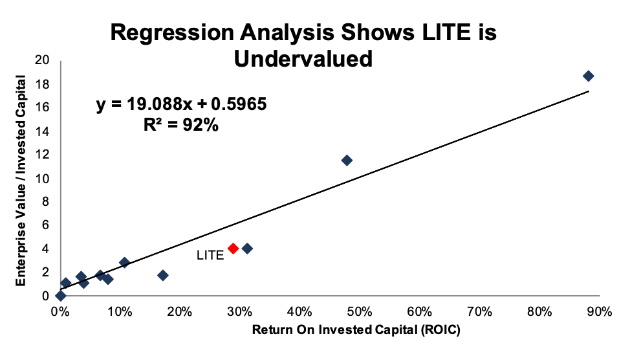 LITE is cheap by both traditional and advanced metrics. The company currently has a P/E ratio of 10 and a price to book of 3, both below the S&P 500 averages. As noted above, the company’s TTM GAAP earnings are artificially inflated by unusual tax benefits, but the stock is still cheap even after we adjust for these unusual items. 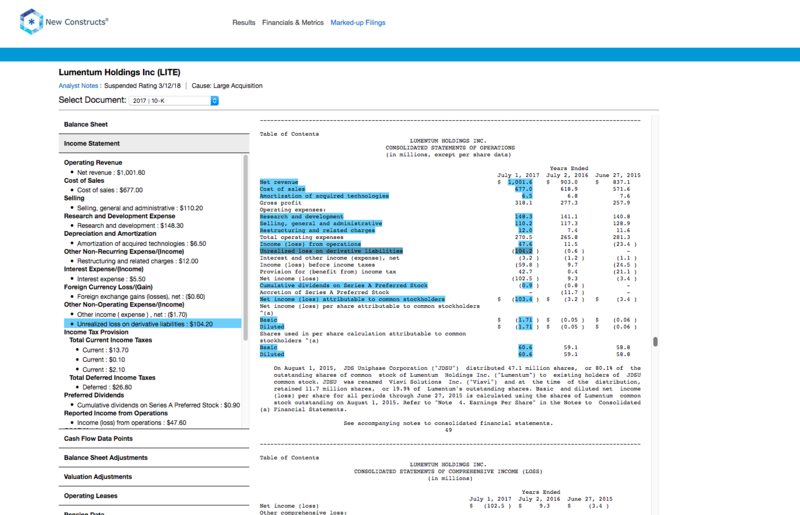 At its current valuation of ~$45/share, LITE has a price to economic book value (PEBV) of 1.1. This ratio implies that the market expects the company’s net operating profit after tax (NOPAT) to grow by no more than 10% for the remainder of its corporate life. Given the growth opportunities of the company’s technology, along with its potential synergies with Oclaro, such a low expectation seems overly pessimistic. 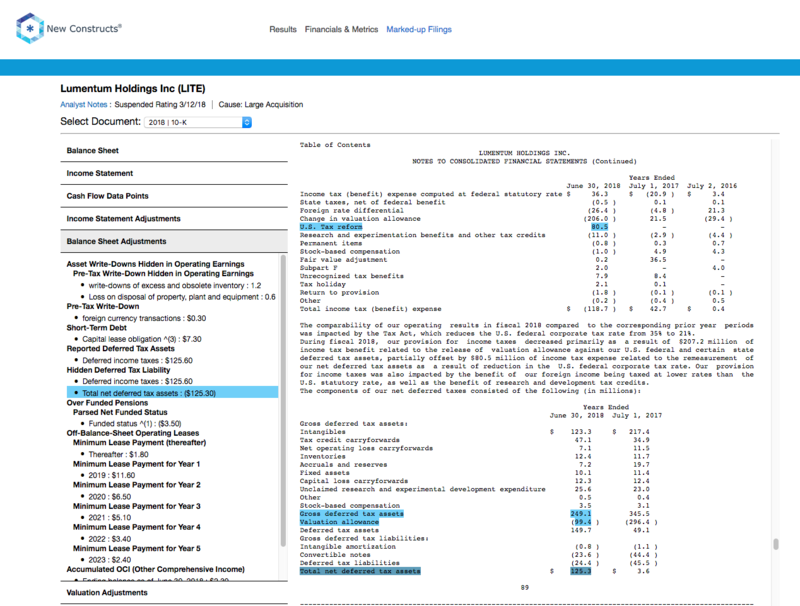 Modeling the company’s future cash flows is difficult given that we don’t yet have filings for the combined company after the Oclaro acquisition. If we estimate that NOPAT margins fall from 14% TTM to 11% (LITE’s margins for 2018), and the company grows revenue at 8.5% compounded annually in years 2-10 (half the rate of projected VCSEL industry growth), the stock is worth $65/share today, a 42% upside from the current stock price. See the math behind this dynamic DCF scenario. In this conservative scenario, LITE would have an average ROIC of 13% over the next decade, which is less than half of its current 29% ROIC. Profit growth independent from Apple that is masked by accounting distortions. Growth opportunities for other uses of VCSELs, non-VCSEL products, and through synergies with Oclaro. 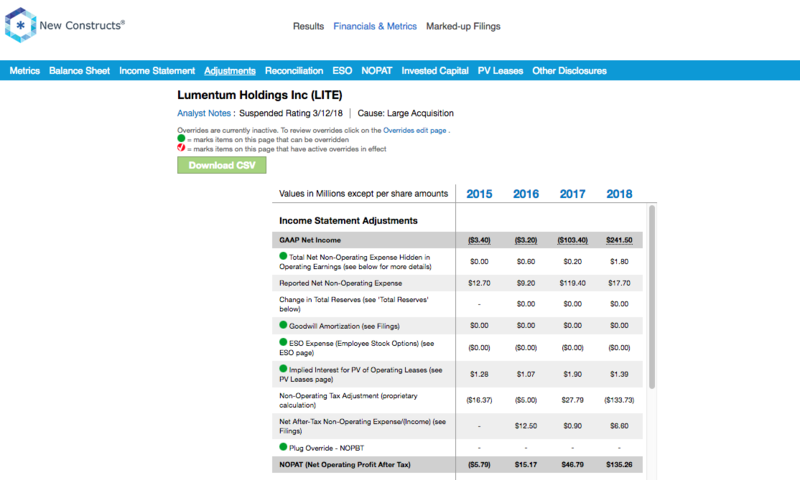 Lumentum does not currently pay a dividend on its common stock, and it has never bought back shares since it was spun-off in 2015. With the Oclaro acquisition, which cost the company $960 million in cash (compared to $666 million in excess cash on the balance sheet), investors should not expect the company to return capital to shareholders in the near future. LITE’s executive compensation plan, which includes base salary, annual cash incentives, and long-term equity awards, focuses on operating income and revenue. The simplicity of this plan is preferable to companies that include easily manipulated non-GAAP metrics, but it would be good for shareholders if there were some emphasis on capital allocation as well. In particularly, we would prefer to see executive compensation tied to ROIC, since there is a strong correlation between improving ROIC and increasing shareholder value. However, LITE’s current exec comp plan has not led to executives getting paid while destroying shareholder value. In fact, quite the opposite is true. Economic earnings, the true cash flows of the business, have grown from -$31 million in 2015 to $135 million TTM. There is little insight to be gained from recent insider trading trends, as they have been minimal. Over the past 12 months, 280 thousand shares have been purchased and 214 shares have been sold, for a net purchase of 67 thousand shares. These purchases represent less than 1% of shares outstanding. Short interest trends are more insightful. There are currently 4.8 million shares sold short, which equates to 8% of shares outstanding and 3 days to cover. Short interest has fallen 54% since August, down from 10.5 million shares sold short and 5 days to cover. Most of the shorts seem to have covered after the stock’s sharp drop over the last few months of 2018. Income Statement: we made $161 million of adjustments, with a net effect of removing $106 million in non-operating income (9% of revenue). We removed $134 million in non-operating income and $27 million in non-operating expenses. 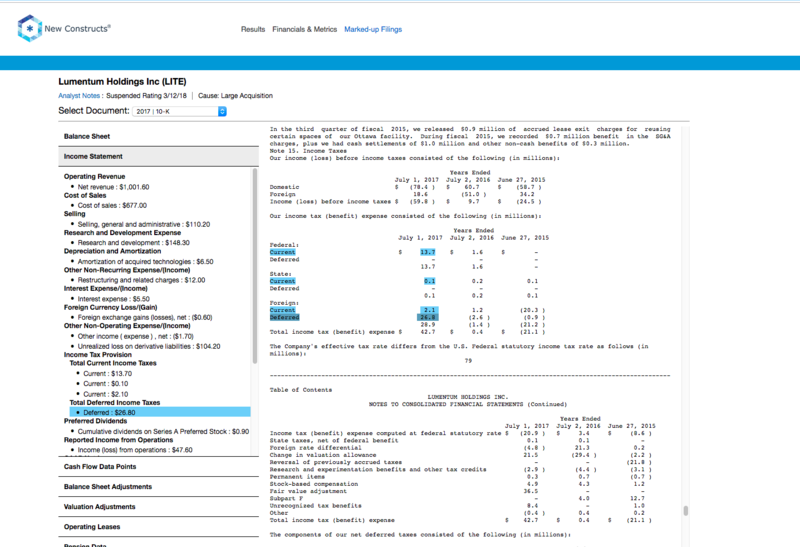 You can see all the adjustments made to LITE’s income statement here. Balance Sheet: we made $819 million of adjustments to calculate invested capital with a net decrease of $743 million. Aside from the excess cash referenced above, the most notable adjustment was $126 million in deferred tax assets. This adjustment was equivalent to 9% of reported net assets. 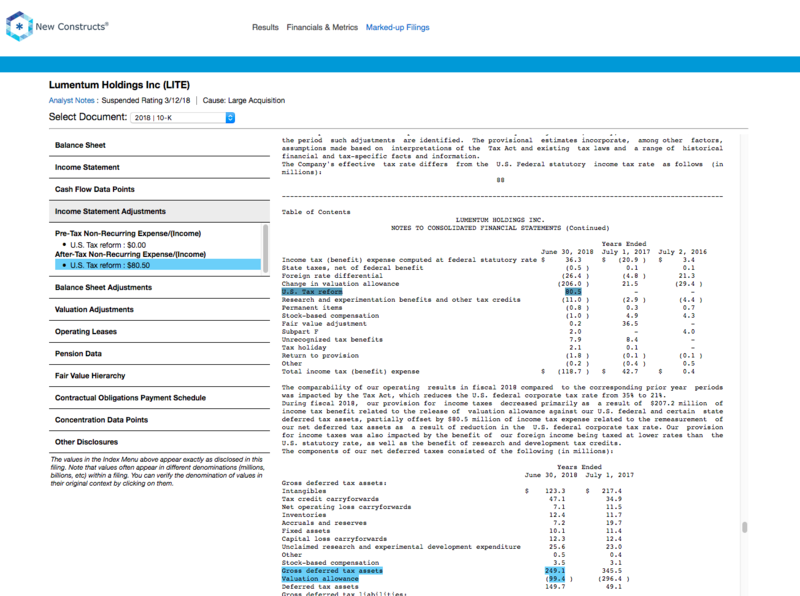 You can see all the adjustments made to LITE’s balance sheet here. Valuation: we made $1.1 billion of adjustments with a net effect of increasing shareholder value by $261 million. There were $666 million of adjustments that increased shareholder value and $405 million of adjustments that decreased shareholder value. There are no Attractive-or-better rated funds with greater than 2% exposure to LITE. Investors that want exposure to LITE should be the stock directly. This article originally published on January 23, 2019.